The Geneva climate change talks came to a close on Friday with delegates from 194 countries adopting the 86-page text as the basis for negotiating a climate agreement in Paris, in December 2015. The six-day session of the Ad Hoc Working Group of the Durban Platform for Enhanced Action (ADP), United Nation’s subsidiary body on climate change, made considerable progress on the outputs from the last round of talks in Lima, Peru. Inputs from all countries meant that the draft text more than doubled in size from the 37-page draft accepted in Lima to its current version. The challenge in the subsequent ADP sessions prior to the Paris summit will be to steamline the text by deleting duplicate suggestions, narrowing down the options as well as reaching a consensus on the legal nature of the eventual climate agreement that will come into effect in 2020. 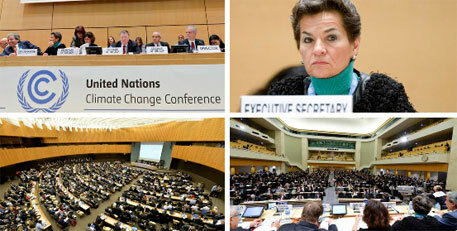 In order to facilitate these challenging discussions around the streamlining of the text and to clarify the legal nature of the agreement, the next round of scheduled talks will take place in Bonn in June 2015, and will be followed by two additional sessions—August 31 to September 4 and October 19 to 23, also in Bonn, Germany. Other ministerial-level meetings during the year such as the Major Economies Forum, the Petersburg Climate Dialogue, the African Ministerial Conference of the Environment, G7 and G20 meeting are also expected to feature climate change high on their agendas. “This fulfils the internationally-accepted timetable for reaching a possible treaty because it alerts capitals to the fact that a legal instrument could be adopted in Paris. It does not, however, set this possibility in stone – it merely opens the door for this possibility,” said Christiana Figueres, Executive Secretary of the UN Framework on Climate Change (UNFCCC), indicating that much work still needs to be done prior to a final agreement being reached in Paris. a) Are the negotiations towards a one-time agreement or is it meant to endure through multiple commitment periods? b) How will the institutional mechanisms created since Copenhagen be dealt with in the new agreement? c) Should identical provisions apply to both mitigation and adaptation or should it be of a different nature? d) What would belong to the agreement and what would be better suited to Conference of Parties (COP) decisions and why? However, a number of developing countries were of the view that it is too early to discuss the structure of the agreement and it is the legal form of the agreement that must be agreed upon first. 3. Workstream 2 – pre-2020 climate actions: The Geneva session also saw discussions take place on climate action in the pre-2020 period. Many developing countries made strong statements pointing out that the Workstream 2 discussions risks being an academic exercise if there is no “more, faster and now” implementation. The Like Minded Developing Countries (LMDCs), for instance, emphasised that the pre-2020 ambition gap would not exist if developed countries had committed to reducing their greenhouse gas (GHG) emissions by 40 per cent below 1990 levels by 2020. South Africa stressed that an immediate way of contributing to the pre-2020 ambition is to ratify the second commitment period (of the Kyoto Protocol). The lukewarm responses from some of the developed countries which were deflecting responsibility with calls for “engagement of a broad range of actors (and not just state actors)” meant that talks could not progress towards more concrete commitments and actions at this stage.